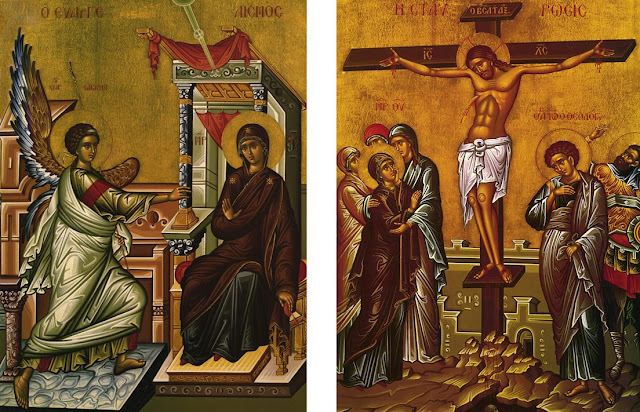 Christ The Bridegroom: Good Friday and Annunciation…Together? This year, Great and Holy Friday falls on March 25, the Feast of the Annunciation. The Byzantine Church doesn’t move the celebration of the feast, which might seem strange! However, I'd like to propose that it actually makes a lot of sense. In these two events we see the awesome condescension of God, and we can look at both of them through the role of Mary, the Mother of God. First, at the Annunciation, God condescended to become man through Mary. Mary said “yes” in behalf of humanity, receiving in her body--as in a chalice--the gift of divinity, so that it could be poured out into the world in a way that we could receive it. a lamb He became in her; He emerged bleating. and He put on a despised hue and emerged. He emerged from [her womb], the One who clothes all. Secondly, at the Crucifixion, the Lord made another great act of condescension: the acceptance of physical death. And again, Mary was there saying “yes,” this time in behalf of the Church, receiving the gift of eternal life that was pouring forth from Jesus on the cross, as He changed death into life. The mystery hidden from all ages and unknown to the angels has been made known to those on earth through you, O Theotokos. God has taken flesh in a union without confusion, and willingly accepted the Cross for us; whereby He raised the first-formed Adam and saved our souls from death. Fun facts aside, this Great and Holy Friday is a beautiful opportunity for us to reflect deeply on the mystery of the self-emptying of Christ through the Incarnation, with the Mother of God as our teacher and model. We can allow her to teach us how we can be a chalice like she was—receiving the love of God and pouring it out to others by loving them, making it accessible to them and helping them to thirst for more. This year we lose our Annunciation mitigation of the fast for fish and oil, we get a major headache trying to decipher the liturgical typikon, and we feel the awkwardness of celebrating the Divine Liturgy on Great and Holy Friday…but theologically it seems very beautiful and meaningful to me to celebrate these two earth-shattering events of the Incarnation on the same day. Disagree if you want!...It won’t happen again until the year 2157 anyway! Thanks! I actually did read some of that article while working on this one. Very interesting! God bless!